If cute animal selfie masks are the wave of the future, then Facebook isn’t going to sit idly by. The company will be updating its in-app camera function with some Snapchat and Prisma style functions soon. 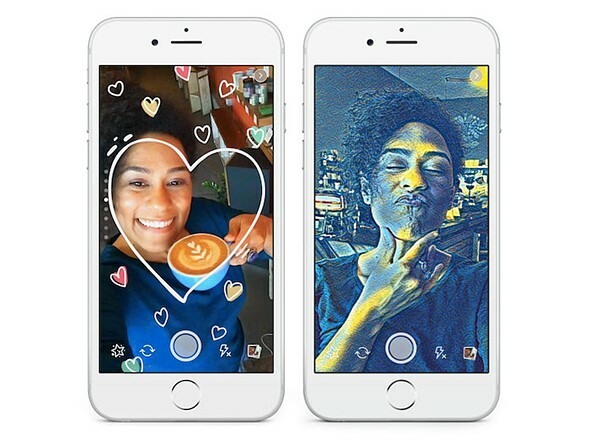 It is currently testing a new version that includes animated selfie masks, overlaid graphics, and geofilters, similar to those available on Snapchat, and a range of filter effects that convert your images and videos into fine-art paintings, like on the popular Prisma app. In addition there is a series of new ‘reactive’ filters that respond to movements of your body. They cover the screen with ‘bubbles’ that can be move around by waving your arms, or line patterns than be disrupted by motion. Once you have accessed the new camera, filter options can be made visible by swiping down. In addition, you can tap on the new creative tools button for even more effects. The latter include pieces of virtual clothing and fashion accessories and art-filters. And it’s not just the filters that will remind you of Snapchat. Like on Snapchat, photos disappear after a 24 hour period, unless unless someone leaves a comment to start a conversation. The new Facebook camera features are currently being tested in Ireland, but should be expected to roll out globally soon.